It was a cold night on the 2nd June at Steventon Sports that 10 hardy over 55 players turned up to battle it out for the Founder Members trophy 2016. K.Fisher, B.Duff, B Moody, B.Adams, G.Brind, A.Humphries, A.Wood, D.Coles, M.Crook, B.Parker all turned out on a cold evening – thank you. A couple of preliminary games and we had 8 players to get down to the finalists with both the finalists coming from those preliminary games. All-in-all we had some tense games going to 3 and 1 stick in some drawn legs. 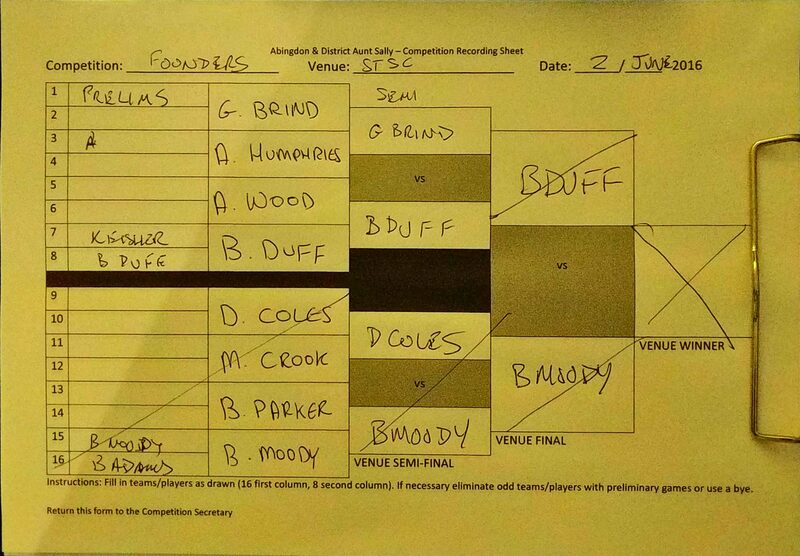 In the end Bob Duff (Ab Utd) and Brian ‘Laddie’ Moody (Steventon Sports) were victorious in securing their places in the final which will be played on Finals Night 14th Sept at Ab. Utd FC.